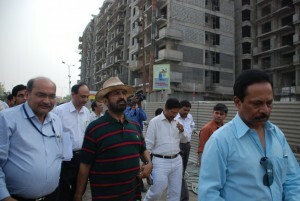 Mr. Suresh Kalmadi Chairman,CWG 2010 Organising Committee (with T-shirt & hat) with media persons at the Games Village construction site, Delhi. New Delhi: India is gearing up to host the 2010 Commonwealth Games in New Delhi. Construction of the Games Village and other infrastructure projects are moving at a fast pace. With less than 500 days left for the Games, people connected with the preparations are confident that all the necessary needs of the Games will be ready as scheduled and security procedures in place. 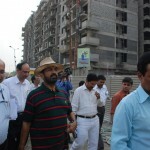 Mr Kalmadi recently visited the Games Village construction site and addressed the media. He assured that “There is no need to worry regarding the progress of the Games projects as most will meet their December 2009 deadline. About the security issue, Mr. Kalmadi said, “the turmoil in neighbouring countries has made it necessary for India to be extremely careful.” And further said that India was aware of global security standards and many foreign consultants are helping us in this matter. He disclosed that 44 per cent of work at the Games Village is complete and the project will be completed by December this year. The Fifth Coordination Committee Meeting of the Commonwealth Games 2010 held here from 11-13 May , expressing satisfaction with the preparations of the Games. The members assured the Organising Committee CWG 2010 Delhi that they would extend all the guidance and support required to make the Games successful. Seventy one countries and 8000 athletes are expected to participate in the Commonwealth Games 2010 to be held in October next year. I would like to know as to what kind of technological security measures are being taken for cwg 2010? Is technology industry contributing in this concern? Mr Kalmadi should also tell us at what cost the Games’ venues will be built in time. The Games budget has already hiked three times and is likely to shoot up more. And how many medal will India win in the Games? Mr Kalmadi’s big mouth will not open to this question.